Ithaca, NY – July 30, 2012 – Spider Holster, (www.spiderholster.com) a company specializing in unique holster-style carrying solutions for photographers, today announced the addition of the Spider Arca-Swiss Clamp to its full range of camera accessories. Designed for photographers who shoot with the popular Arca-Swiss-style L-brackets, the easy-to-attach Spider Arca-Swiss Clamp provides a mechanism for all shooters to take advantage of Spider Holster’s secure, back-saving carrying solutions while keeping their Arca-Swiss camera setup clear of any attachment when connecting to their tripod. When using the Spider Holster system on its own, users simply attach the Spider Plate and Pin directly to the 1/4-20” tripod mount on their camera. When photographers add accessory brackets or plates to the body, these brackets occupy the sole attachment point on their camera. With the Spider Arca- Swiss Clamp, Arca-Swiss plate users now can easily carry their gear with Spider Holster to reduce the stresses on their upper body. 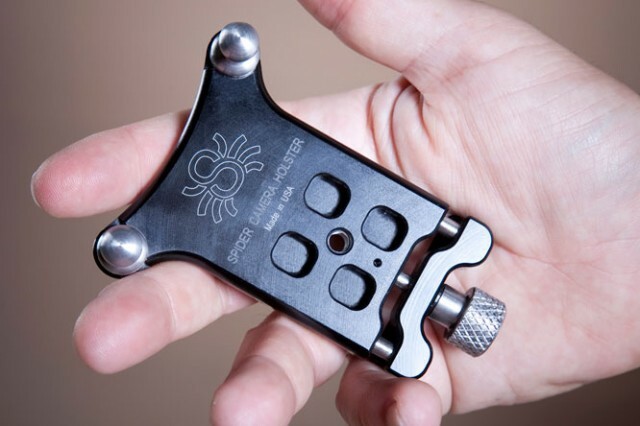 Compatible with any bracket or plate that features the Arca-Swiss geometry, including those from Wimberley, Really Right Stuff, Kirk, etc., users simply twist the pressure screw allowing the Spider Arca-Swiss Clamp’s sliding jaws to release and are free to connect the camera to their tripod. Compatible with both the Spider Holster SpiderPro and Black Widow, the Spider Arca-Swiss Clamp carries an MSRP of $95.00 and is available for direct purchase. To find a local retail outlet or to learn more about Spider Holster products, please visit the Spider website at: http://www.spiderholster.com.